Home in Portland, day 1. Xmas shopping done. Mom suggests some family time– visiting “Distillery Row” on Portland’s Eastside (Note for you East Coast readers– this is Portland OREGON not Maine ;). An affiliation of several distilleries has sprung up over recent years. Obviously, this must be investigated. tea flavors), peppermint bark (chocolate infusion with peppermint oil) and eggnog. 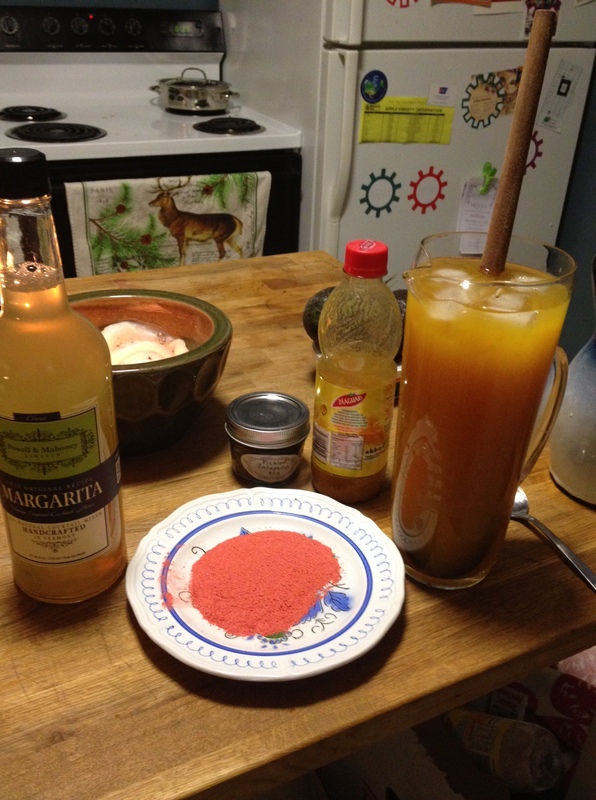 the tasting ended with a short cocktail of your choosing– hot apple cider with spiced rum or horchata (Mexican rice milk) with coffee liquor. We went home with some vodka and some liquors my mom will use in martinis. Note: if you end up buying something, the $5 tasting fee is waved so sample before you buy! Our second (and admittedly final) stop was New Deal Distillery (http://www.newdealdistillery.com/). They’re situated in a large, open space with the tasting counters nestled in a corner among the distillery equipment. For $5 you get a flight of samples and go home with one of their shot glasses. We started the sampling with the New Deal Vodka. Crisp, clean and smooth– no doubt an excellent choice for any liquor cabinet. It was the next sampling, the New Deal Gin 33 that blew us away. New Deal has established its self as not just high class, but high quality. With a strong juniper nose and smooth finish, my step-father couldn’t wait to get a bottle into his stash for future martinis. My folks sampled with unsweetened, cold pressed chocolate infused vodka. I thought it was a bit bitter, made directly from the raw cocoa. My step-father thought it was excellent– funny since I think he enjoys sweets more than my savory self. To each his own! Next up was a choice of either the coffee liqueur or ginger liqueur. I, of course, went for the ginger. What a bite! I love ginger and this did not disappoint. It imparted a strong and savory ginger flavor without overwhelming or making you feel like a ginger-breathing dragon. Which brings us to “Hot Monkey,” their spicy vodka. Infused with five different hot peppers, this has a smooth finish as far as the vodka goes but leaves your mouth with a bit of a burn. I’m sure its great with pineapple juice– in fact, the mixing options are endless! Needless to say, we left with a few more bottles and some new shotglasses. Note that Distillery Row (http://www.distilleryrowpdx.com/), the affiliation of this neighborhoods distilleries, offers a “passport” which you can have stamped was you walk from place to place and sample the wares. At $20/each, the passport allows you free samplings at all member locations. Sounds like a great activity for out of town guests, birthday parties, etc. As a side note– how do you feel about Bourbon and being gluten free? Once one of my favorite drinks, a good friend and I have have been debating if we get “the gluten hangover” from Bourbon. I took a (thimble-sized) risk yesterday and feel a little off today– but then I ate a fair bit of chocolate (which my stomach doesn’t enough as much as my mouth) so who’s to say? I know there are the purists who say even the distilling process can’t remove all the gluten… yet I know on principle it in fact should. Let’s go to the empirical evidence– are you gluten free? Do you drink Bourbon? Why or why not? Leave your response below. This entry was posted in Drinks, Travel and tagged bourbon, distillery, Portland, vodka on December 23, 2012 by gfvermont. 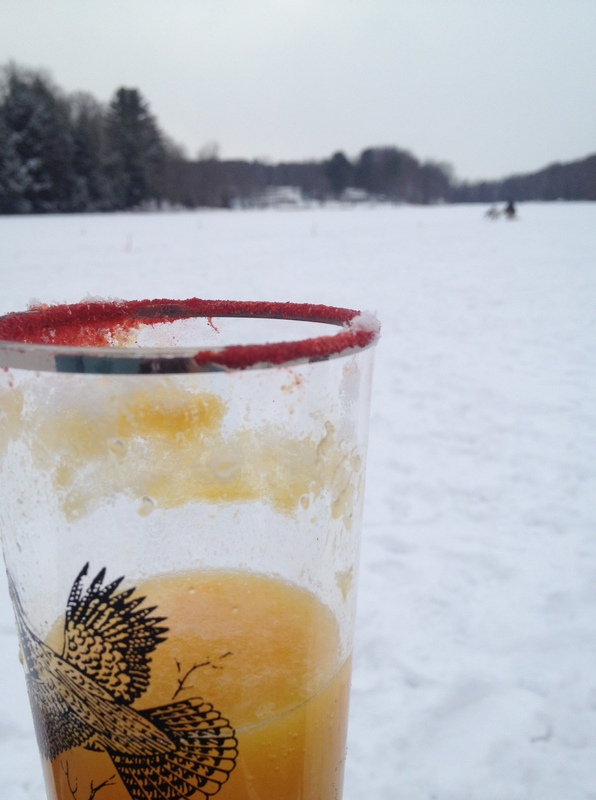 Well, nothing to report but bad news here [spoiler alert– Farmhouse bloodies are NOT GF). Last weekend I had a Bloody at Farmhouse in Burlington, after the bartender “checking” and telling me all the ingredients were in fact gluten free. That evening I had, um, a little distress. I chalked it up to the brownie I ate the day before, as I’m mildly allergic to chocolate and figured I’d overdone it. 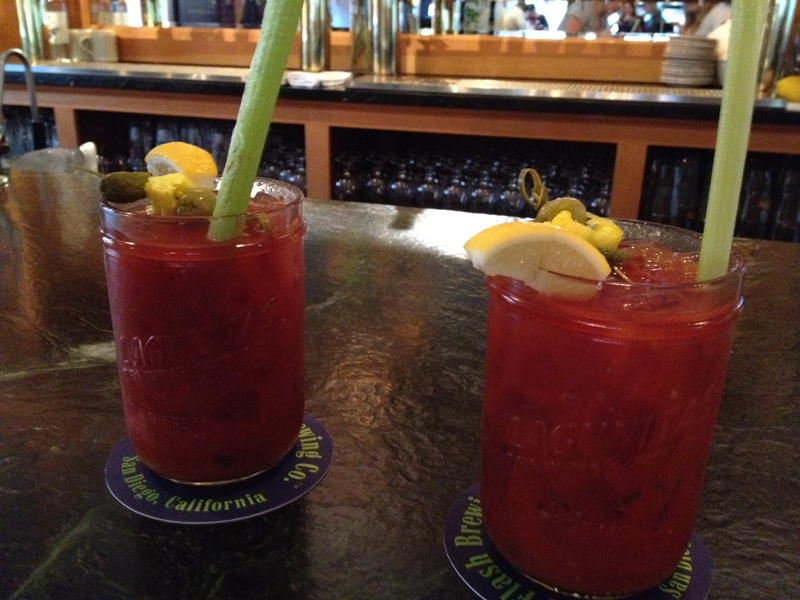 Fast forward to the following Sunday, when I go back for another Bloody. The waitress almost ripped it out of my hands (I’d ordered at the bar and brought it to the table) after hearing I am a Celiac– turns out she is too. in addition to some ambiguity (See aforementioned “Kate’s Rule” that states “Paranoid as you wanna be”) about gluten in hard alcohol (I can see this needs to be addressed in another post), the waitress informed me they use Worchester sauce that IS NOT gluten free. The tomato juice and some other ingredients were questionable in her mind. So, the upset stomach the previous week is making more sense. What a disappointment. 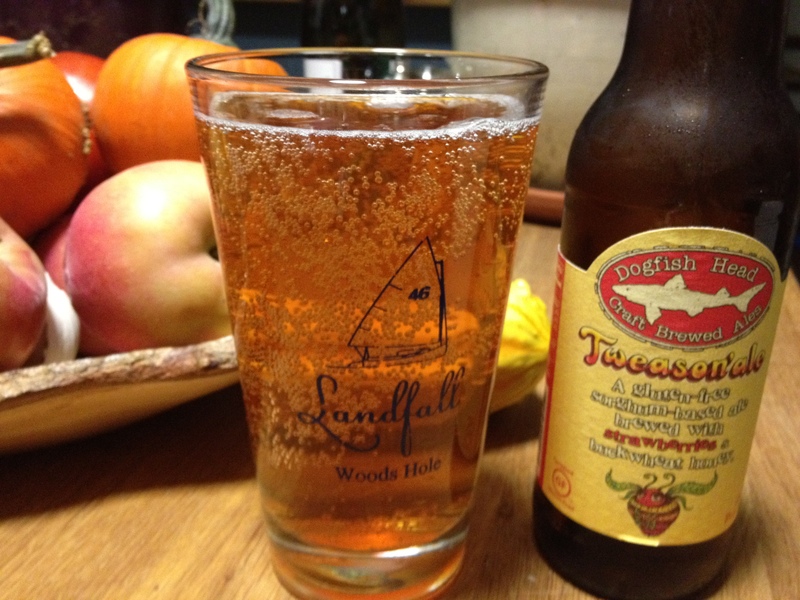 Farmhouse– any chance you’ll be mixing GF Bloodies any time soon? NOT GLUTEN FREE Bloody Marys at Farmhouse. But aren’t they pretty? This entry was posted in Drinks, Labeling, Vermont restuarants and tagged burlington, drinks, NOT gluten free on October 21, 2012 by gfvermont. A friend was visiting and wanted to try someplace I’d never been before (keep in mind I’ve only lived in VT 2 months so everything is new and great!). We headed to Leunigs and expected a wait (turned out to be 45 minutes, reasonable for a Saturday night), so went upstairs for a drink and an app. It was easy to get seated there and there were plenty of GF items on that menu– cheeses and meats, etc. [Note, I already knew the Vermont Smoke and Cure products they featured were GF]. While enjoying our apps and a glass of wine, a near-by customer was discussing GF options with the waitress (I mean, really? Small world!). It sounded like some of the GF options on the main menu aren’t available in the 2nd floor bar– something about the GF rolls being in the basement freeze and having to be retrieved by the kitchen staff– all too complicated for them to execute on a crowded Saturday night. Personally, I’d rather they say they can’t handle it than, say, pop a roll in a wheat-filled oven to thaw and serve me something contaminated. Or have them piss off the kitchen staff who spit in my food. 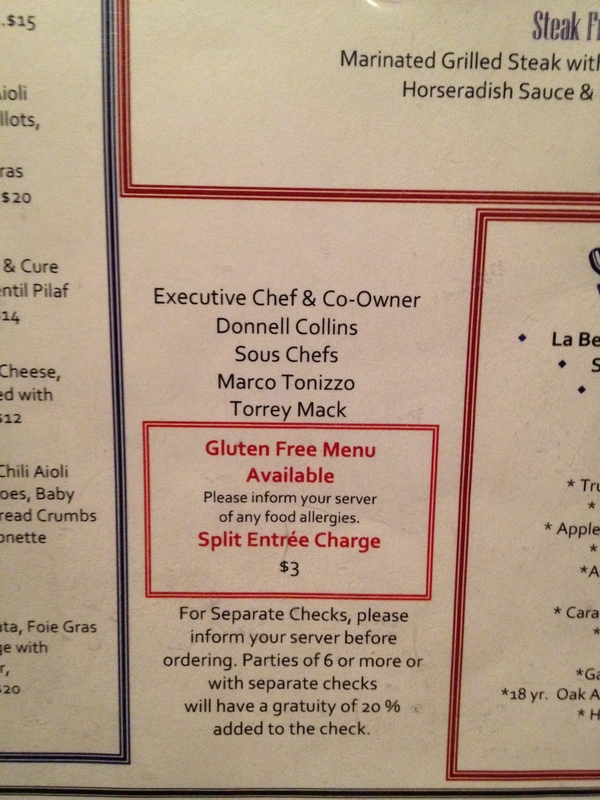 The gluten-free menu was a subset of the full menu and didn’t contain many or any specialty items that I noticed (such as a gluten-free bun– maybe the lady upstairs was just trying to convince them to carry them in the future?). It did have a wide range of options– you could have handed anyone that and they’d believe it was a full menu, that’s how many items were on it. One point of caution is that their frialator is used for things that contain wheat so if you are Celiac or truly very sensitive, you will want to avoid those items. For me, they substituted fries for garlicy kale (tres Vermont!). So, Leunig’s, way to go. Let’s see you continue to expand your GF services.